Wooden Shed or Plastic Shed – What to Choose? The environment should be respected and many people are trying to save/impact it with small steps that, collectively, could impact the atmosphere in a major way. If you are looking to be more eco-friendly, why not include your garden in your plans? Growing your own fruits and vegetables and using rainwater harvesting systems are just a few of the ways you can become more environmentally-friendly. If you are looking for different methods to reduce your carbon footprint, keep in mind that your garden shed can play a huge role. 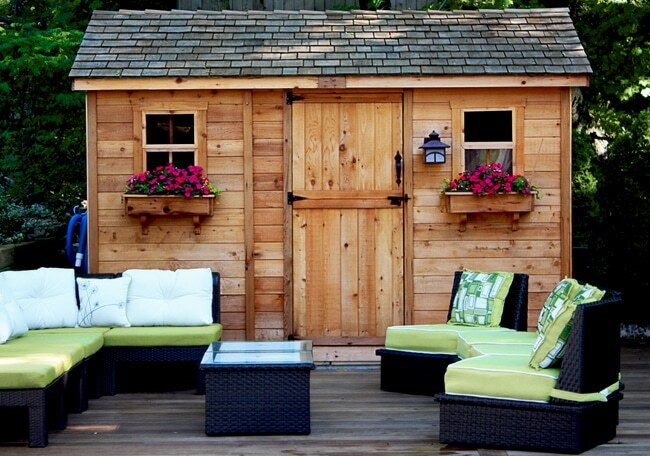 There are quite a few incredible ways to transform your shed into an eco-friendly zone. Wooden Shed or Plastic Shed? If you need to replace your old shed with a new structure, make sure that you choose one which is made out of responsibly-sourced material from an ethical manufacturing company. When trying to decide between a wooden shed or plastic shed, wood is your best choice in our opinion. Wood has a negative carbon footprint and acts as a carbon sink which is excellent. This means as a tree grows, it stores carbon in its fiber. When a tree is harvested and cut down and made into a shed or other building product, the carbon stays in the product and does not get released until the life cycle of the product has ended. In comparison, sheds made from plastic, steel and aluminum use a tremendous amount of CO2 in the production process which is released immediately into the atmosphere. This release of carbon during processing increases the global warming crises we are now in. Garden sheds made with plastic are also more difficult and expensive to recycle and use additional CO2 in the recycle process. By using easier to recycle materials such as wood, you lessen your carbon footprint as well. If a wood shed is well-constructed and prepared properly for the elements it can last for a very long time, particularly if made from western red cedar, which is naturally resistant to decay and rot. Other wood species, such as pine, can be chemically treated to extend its life to replicate cedar wood. If you prefer, you can finish your wood shed yourself with special treatments to make it weather and water proof. These treatments will give your outdoor space the look you desire and make sure that extreme weather conditions do not cause any damage and that it will last for years to come. Meanwhile, remember to check the credentials of the company you are planning to buy from, either wood, plastic or metal, to ensure that they are environmentally-conscious and the materials they use are 100% sourced from certified materials, procedures and standards. If you buy a shed from an overseas manufacturer, consider that country’s environmental practices and the materials they are using. Ethical companies in North America, particularly forest companies, will always go through the effort of achieving certified accreditation from such organizations as the Forest Stewardship Council (FSC) or The Program for the Endorsement of Forest Certification (PEFC). Both accreditations are confirmed only through independent third party inspections, ensuring the wood they are harvesting comes only from legally and sustainably managed forests. Like pergolas, gazebos, and other outdoor structures, a wooden shed or plastic shed is an excellent addition to your property. All structures offer you an outdoor space that you can make good use of and also add value to your property. Western red cedar garden sheds are a fantastic option if you are looking for an outdoor structure made with eco-friendly materials. By choosing a shed made of wood, you are making sure that you reduce your carbon footprint and contribute to making the earth a greener and cleaner place.